written by Syed Yasir Ali on March 2, 2019, 10:05 p.m.
written by Waqas Mehr on July 12, 2018, 5:11 p.m.
written by Abdullah Naveed on April 20, 2018, 3:37 p.m.
5 stars for the Biryani but with time it becomes costly and also the portion of biryani is reduced.???? written by Dr.Ahsun Rafi Kazmi on Aug. 19, 2017, 6:42 p.m.
Karachi Biryani Restaurant In Barkat Market LahoreWe all love the extra dose of chilli, aur teez masalay ka jhatka one day or the other. Bhai biryani ka koi mazaak nahee hai! We all love our biryaanees and jab ghar pay na ho tou you can always order out. This is one of the staple desi dishes that you can have anywhere and at any time. No one can resist the aromatic splendor of a plate of spicy hot biryani with perfectly spiced meat, tender and lusciously soft to tantalize your palate and taste buds. The melt in your mouth rice cooked to perfection with the right amount of tang and punch in the dish to whet your appetite for a lot more.Yes our love for biryani cannot be understated and what’s better than being served a hot plate of a delicious plate of your favorite dish while you easily lay low and relax at home. Yes the one question you should ask is Kya Caahiyay? And the answer is pretty simple! It is Karachi Biryani.From the array of biryani joints in Lahore, Karachi Biryani is one of the best options for you! Their deliciously fiery biryani never seems to disappoint because of the superior flavor they promise along with sufficient and hefty portions to satisfy your hunger. So whether you have friends over or just want a quick desi delight to make your day a tad bit better, fear not. Just log on to our website and order food from the best biryani restaurant in Lahore, sindhi ho ya bombai, hydraabdi ho ya mughlai you get the picture right. Go to our website and order from Karachi biryani. 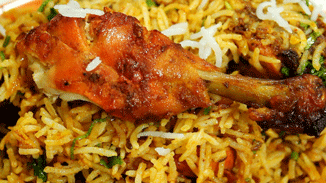 Not only do they have the best biryani but they also have delicious barbecuemenu for you to choose from as well.